There are so many places to visit across the UK for all things Harry Potter, all with magical connections to the wizard world of Harry and Hogwarts. Maybe a trip to Alnwick Castle or Durham Cathedral to see the locations from the film or a day at Harry Potter World where you can sample Bertie Botts Every Flavour Beans straight from Diagon Alley, there’s plenty to suit every J.K Rowling fan. We have yet to experience one of the Stick Man Trails, but they sound like great fun, brought to life by the fabulous Julia Donaldson. Not only is the trail a great way to explore nature, with a host of downloadable activities from their website, you can even have fun on rainy days! This will definitely be something the Morrison clan will investigate further. You already know our love of the Lake District, I can remember staying in a cottage that was completely dominated by Beatrix Potter characters, the children adored it. Younger children can enjoy the Beatrix Potter Lake District Trail, following the clues to find her iconic characters amongst the countryside and for older children, a visit to her house is a brilliant insight in to the writer’s life. 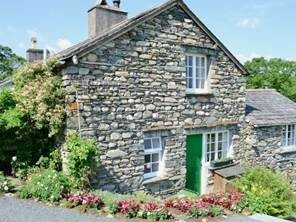 If you are looking for a quiet getaway, This cottage adjoins a 17th-century farmhouse on a traditional Lakeland working hill farm, once owned by Beatrix Potter, (now owned by the National Trust). It enjoys a very quiet and secluded position, in a superb setting surrounded by rocky bracken-covered hills and high fells, in the heart of Lakeland. The views from all windows are across the magnificent Langdale Valley to the surrounding woods and mountains. Enjoy the tranquil splendour of this idyllic setting in a TV free cottage to enable you to relax in peace of a true away from it all holiday. Maybe a trip to Yorkshire, where I grew up. Haworth offers the chance to see the train station featured in the film versions of E. Nesbit’s Railway Children. A glimpse into the past, the traditional station is a great introduction to the classic book of adventure. Haworth also has a wealth of literary history with connections to the Bronte sisters for slightly older readers. For most Thomas fans, a trip to their local train station is a great way of catching a gliompse of a train similar to Thomas, but if you’re looking for a family day out, with 12 wonderful themed rides and a spectacular indoor play area why not visit Thomas Land at Drayton Manor? What could be better than messing about on the river, why not join Ratty, Mr Toad and Badger at the River and Rowing Museum, just off the Thames. See the characters of Kenneth Grahame’s Wind in the Willows come alive and learn more about the river systems and environment in the process. You can also enjoy watching the boats and rowers take on the water outside. Marmalade sandwiches anyone ? The classic stories of Paddington Bear, can be brought to life with a trip to Paddington Station. See where Michael Bond’s fictional bear was found and if you have time, why not take the Paddington Bear bus tour which takes in some of the famous locations from the film. Xene has a great love for all things Alice, i’m sure she would love her very own Mad Hatter’s tea party? At the St James Court Hotel in London, the eclectic menu of cakes and pastries include ‘Queen of Hearts’ Mango Tarts, ‘Drink Me’ strawberry potion, ‘Caterpillar’s Mushroom’ Raspberry Marshmallows and Pocket Watch macaroons. Book at least 24 hours in advance to secure your place! All the children have got their favourite book by Roald Dahl, why not visit the museum created in his honour. Featuring three interactive galleries, find out about Roald Dahl’s school days, see his original Writing Hut and in The Story Centre put your imagination centre-stage with fantabulous activities to inspire your little writer. I used to love that Tartan wearing bear, and used to wear my tartan trousers with great pride when I was younger! If you are a Rupert fan why not head to the Canterbury Museum, fans can see original artworks from author and illustrator Mary Tourtel, as well as memorabilia and images of the latest animated Rupert Bear. All of the Morrison children (and their mum too) have a huge love of all things Winnie The pooh, so why not book a relaxing break on the edge of Ashdown Forest. A.A Milne was inspired to write his endearing collection of stories here. There are a number of Pooh Walks to help guide you through the settings for some of his favourite tales and see Pooh, Christopher Robin, Piglet and Eeyore come to life. 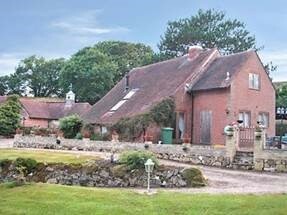 Lovingly restored, this is an unusual detached period barn with a wealth of exposed beams nestling in the owner’s 15 acres of grounds. This area offers 6,500 acres of open heathland on the highest sandy ridge top of the High Weald Area of Outstanding Natural Beauty. Despite its name, woodland makes up less than 40% of the total area. Sheep, cows and goats graze freely side by side amidst the walkers and motorists. Not just in books, Peppa Pig has been a favourite for most of our children, we have numerous books and know most episodes off by heart! Have fun at Peppa Pig World, jump in muddy puddles, meet some of your favourite characters and try out some fun rides. One of my childhood favourites, I loved reading about their adventures, and Enid Blyton was one of my favourite authors, synonymous with Dorset, why not take a trip to Purbeck, the town that inspired the stories. There are a number of local activities available including a location tour and museum to learn more about the author, as well as some fabulous little places to stop for an ice-cream. What’s your favourite place to visit ? Glamping - The posh answer to Camping!